I saw, and was knocked out by The Harder They Come: 35 years later, that movie is still the best intro to reggae, to Jamaica, to the little spots of heaven alleged to be Caribbean paradises, especially that one spot of sand and sun that claims Jah-made-it. When I listened to early Bob Marley, my ears were not as impressed as my eyes had been by Cliff in The Harder They Come and the riveting sequence in the recording studio. I swear Jimmy Cliff was not really acting, not making out to be something he was not. What I saw was not a performance: Jimmy was a revelation, a serious statement of struggle, driven—if you have not seen the movie, you have to see it to fully understand what I’m saying, almost possessed in his portrayal of Ivan. And the soundtrack, "Stepping Razor" dangerous is far more than a literary metaphor. On one of a handful of trips to <?xml:namespace prefix = st1 ns = "urn:schemas-microsoft-com:office:smarttags" />Jamaica, I trod the streets of Trenchtown—it was a short walk, a symbolic grounding with the people. I wanted to go. i wanted to see. What I saw, I recognized. I had seen some of it in Tanzania, would see a lot more of it in Haiti, and catch a peep of it in Rio. “It” was Third World poverty - which, by the way, also exists in the USA, if you know where to look and what you’re looking at. In America, poverty is masked by the trickle downs of materialism but Trenchtown had no trickle down. Perry Henzell’s movie The Harder They Come is beautiful in its brutality: its unapologetic depiction of what the system has created and how the Sufferers (the poor) were twisted and deformed, but also their indomitable spirit to resist and push on. Although it is a fictional film, much of it is shot like a documentary, especially the street scenes and the church scenes. Henzell was absolutely insightful in his skewering of class repression and equally unsparing in showing the reality of how the struggle to escape sufferation is most often a futile fight in which the overwhelming majority don’t succeed. Ivan is a truly tragic figure undone by a combination of big dreams and social restrictions that spawned his bad habits and short-sighted behavior. Small sequences illuminate the daily frustrations such as when Ivan goes looking for work and is turned away because he has neither hard skills nor education. We are made to feel Ivan’s humiliation; he is willing to work but is unsuited for the work that exists. Henzell is true to the truth, hence the hero does not survive even as Ivan’s spirit to fight for his dreams is celebrated. Henzell and Cliff do not flinch in confronting both the lure and the limitations of gun violence and drug money. I teach high school in New Orleans. I know “Ivan,” the anti-hero embodied by Jimmy Cliff. What saves the movie from being a grim drag is not only Henzell’s penetrating vision and Cliff’s transcendent performance, it’s also the absolute upliftment of the music. Jimmy Cliff did two things in The Harder They Come that he never again matched. He wrote a brilliant set of music, and, as an actor, he gave us one of the most serious portraits of what it means to be poor, black and male in a society that is overwhelmingly dismissive of that combination of characteristics. When it comes to writing reggae music, nobody comes close to Bob Marley. No question about that. But also no question the music Jimmy Cliff wrote for The Harder They Come is sonic perfection in promoting the point of the movie. The soundtrack continues to sell. It is classic. So, yes, Bob was the better composer but Jimmy Cliff far surpasses any other reggae musician in his multifaceted cinematic turn as the mythic Johnny Too Bad, aka Ivan, whose character was based on a real life, Jamaican folk hero and gangster. In the intervening years there have been numerous movies with black male anti-heroes but none as effective or as honest in the depiction of the social and material reality as The Harder They Come. There is neither the superficial glorification of Ivan nor his temporary success in fighting for his reward on earth. 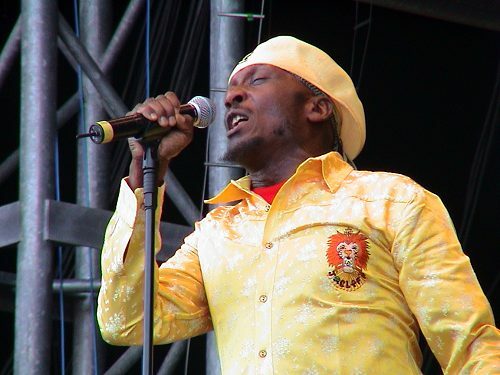 Jimmy Cliff continues to perform and create music but he never again pulled it all together into a concentrated project like he did with The Harder They Come. From the spiritual longing of “Many Rivers To Cross” to the militant defiance of “The Harder They Come,” from the primal urgings of “You Can Get It If You Really Want” to the frustrations of “Sitting In Limbo” these songs are classics of reggae music. The Harder They Come soundtrack CD also includes a brace of early reggae songs that were popular at the time. I’ve included six non-soundtrack songs in this Jimmy Cliff tribute because those songs are also classic. I admire Cliff’s consciousness and how he not only writes about people as we are, but also offers vision of becoming better than we are. Cliff’s anti-war anthem “Viet Nam” (from Wonderful World, Beautiful People) continues to be a relevant statement. In a similar vein are the working class anthem “Struggling Man” and the bluesy “Can’t Stop Worrying, Can’t Stop Loving” (available on Struggling Man). These songs are not only first-rate representations of social reality they are also musically moving. I am especially taken with some of the music from Cliff’s middle-period. The opening song in the jukebox, “Bongo Man,” and the closing song, “Universal Love,” plus the pro-woman portrait “She Is A Woman” are all from the Give Thankx album. “Bongo Man” is both an affirmation of rasta and a philosophical encouragement to superceed politics and religion as currently practiced. “Universal Love” is the injunction I totally embrace. This is my favorite of all of Cliff’s music. A classic movie, a classic soundtrack, both featuring masterful work from brother Jimmy Cliff. About six years ago, I returned to Jamaica for the Calabash Literary Festival held in the beautiful setting of Treasure Beach. I will never forget the conversation with Perry Henzell (born 1936 – died 2006) about movie making and his anecdotes about The Harder They Come, the first feature length movie made in Jamaica by Jamaicans. People such as Jimmy Cliff and Perry Henzell are exemplary artists, socially aware and dedicated messengers, but beyond that, they are also dreamers who confronted the reality into which they were born and forged from that reality visionary art. They inspired us when the movie was newly issued; their artistic production continues to inspire successive generations; and undoubtedly The Harder They Come, both the film and the music, will remain relevant to millions of people worldwide in this new millennium.